Caribbean island Orchid Cay is all Lily Fielding's ever known. But an intriguing newcomer promises a sensual awakening for the unworldly vicar's daughter… Dangerous Raphael Oliveira should resist Lily's beauty. But soon Rafe's intense passion and dark past threaten to destroy them both! Matchmaker Elizabeth Young is horrified that her disastrous marriage to Xander Trakas was never actually annulled! Elizabeth will not give in to the fire that still burns between them—until she learns that guardianship of Xander's nephew depends on their marriage! Nikolai Cunningham isn't going to let photographer Emma Sanders uncover his Russian family history, regardless of their potent attraction. Suspicions aroused, Nikolai casts Emma out—unaware that she's pregnant! When all is revealed, Nikolai will legitimize his heir—with a gold wedding ring! 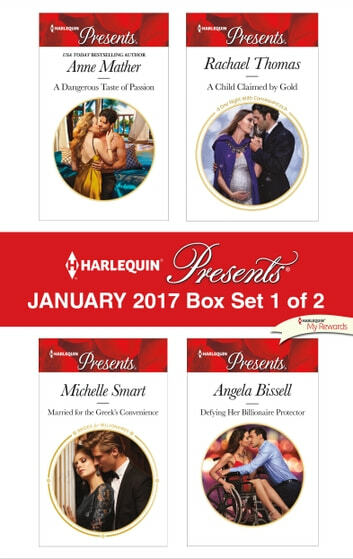 Be sure to collect Harlequin® Presents' January 2017 Box set 2 of 2!